I use oneiric with 0.97.0+tr756-0ppa~oneiric1. Opening onboard settings by clicking in the 3 lines button and then in the tools button (not with onboard-settings) creates a python process in gnome-system-monitor. 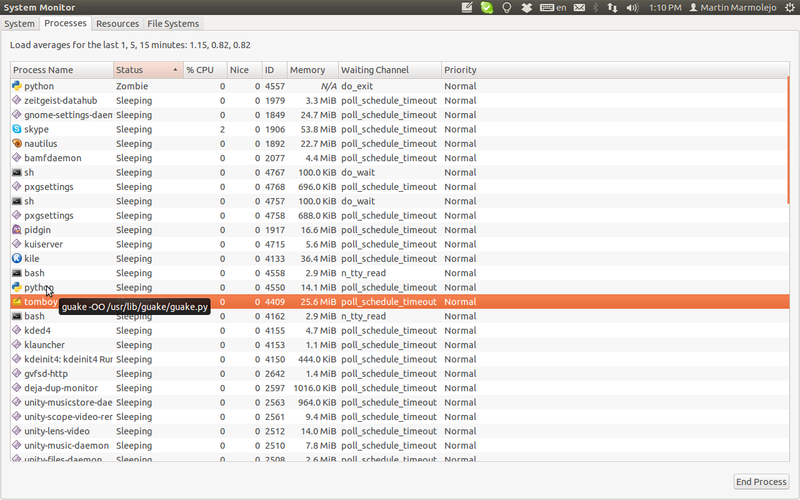 Closing that preferences window don't remove the python process in gnome-system-monitor, it goes to zombie state. I've repeated several times, I attach a picture. Thanks for the bug report. I can reproduce this in Precise too. Every time I press the preferences button another process entry is added and zombiefied when closing preferences. All zombie processes then go away once onboard itself exits. I'll see if I can do anything about this, though I don't believe they can cause problems. The processes are gone and their resources have been freed, only the entries in the process table seem stuck. No more zombies, fixed in trunk. The same thing happens with Guake. It uses a python process and creates another one (the zombie process). I've included a screenshot of the system monitor to show this. Martin, yes, I'd imagine there a a lot of apps doing this.. It's pretty easy to create zombie process entries with python's subprocess module. I've opted to double fork with GLib.spawn_async() in onboard 0.97.1 instead. If you'd like to get Guake fixed, you would need to report the bug at their bug tracker.